Outstanding Lifestyle Host -- Ina Garten of Barefoot Contessa (Food Network), Bobby Flay of Boy Meets Grill (Food Network), Giada De Laurentiis of Everyday Italian (Food Network), Food Trip with Todd English (PBS), and Nigella Lawson of Nigella Express (Food Network). Outstanding Talk Show/Entertainment -- Rachael Ray (Syndicated), now in its fifth season and winner of two Emmy awards in previous years. Outstanding Lifestyle Program -- Everyday Italian (Food Network), Gourmet's Diary of a Foodie (PBS), Lidia's Italy (PBS) hosted by chef and restaurateur Lidia Bastianich, and Nigella Express (Food Network). Outstanding Achievement in Single Camera Photography -- Chefs A'Field (PBS), a cooking documentary that showcases the farm-to-table movement across America; and Food Trip With Todd English (PBS), hosted by celebrity chef and five-star restaurateur Todd English of Olives fame. 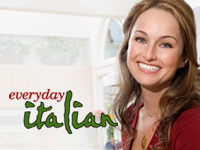 Outstanding Directing in a Lifestyle Show -- Everyday Italian (Food Network), an Emmy-winning series hosted by celebrity chef Giada De Laurentiis. Outstanding Achievement in Single Camera Editing -- Gourmet's Diary of a Foodie (PBS), a show that continues on despite the shutdown of Gourmet Magazine a year and a half ago. Outstanding Achievement in Hairstyling -- Semi-Homemade Cooking with Sandra Lee (Food Network), combining fresh ingredients with select store-bought items as a part of Lee's 70% ready-made/30% fresh cooking philosophy.